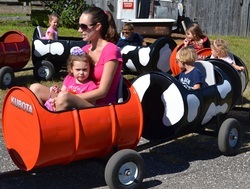 Tim's Train Ride's is a fun attraction for the whole family! As you can see from the pictures on our site, there is no age limit to ride Tim's Train. As long as you are a "Kid at Heart" you are a Kid and you can ride the train! Please enjoy our website and feel free to drop us a line on our Contact page. We would love to hear from you! Even Spiderman dropped by for a ride on Tim's Train!